Does it matter if you believe in tarot? a) that a reader’s choice of which tarot card to pull is divinely inspired, and/or that magnetic energies related to the energy currents swirling around in the present moment cause the card or cards attracted to that energy to naturally be pulled out. According to this line of thought, we can develop our intuition and learn to pay attention to subtle differences in energy, and learn to notice messages from the universe, or from God or gods or angels or buddhas or other beneficial divine beings. It isn’t so much that we believe in the tarot cards, it’s more that we believe in ourselves — in our own ability to discern signs of what’s happening around us energetically. b) that tarot cards contain archetypal wisdom and lessons that have the potential to be instructive and practical no matter what your individual circumstances, if you are able to rationally tease out the connections between these universal life lessons and your particular life. If you sincerely believe (there’s that word, belief, again!) in empowering yourself by contemplating what you can learn from events that happen and from the choices that you make in life, you could pull any random card, consider it, and come up with a useful, practical lesson for yourself, operating on a purely rational level. There is an option c, in which you believe that pulling tarot cards is a total waste of time and the occupation of weak-minded thinkers, but if you believe that, you probably aren’t reading this blog! People often ask me if I really believe in this stuff. The answer is yes, I do, but no, you don’t have to. You don’t have to believe in tarot and you don’t have to benefit from it, but if you want to benefit from it without believing in it, you absolutely can, using the approach I’ve described under point b, above. To describe this catch, of course, I’m turning to a tarot card. 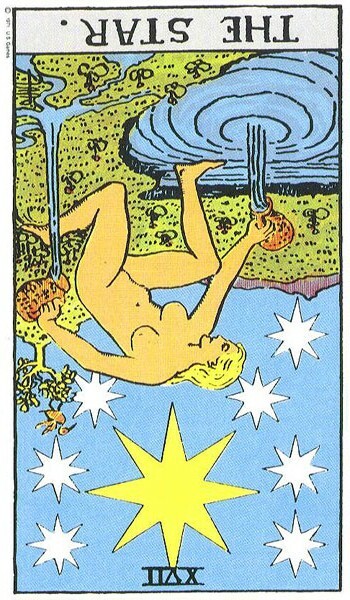 I pulled a card on the question of whether it matters if you believe in tarot, and got The Star, reversed. In this card, I can see both the answers that I’ve described under points a and b, above. We are naked and vulnerable in the world, either way, and either way, we have to find our life lessons where we find them, in the world around us, whether that means that we read tarot cards or that we read nature itself. On the other hand, though — and here’s the catch — if you insist on taking a purely secular approach to your life lessons, then, yes, you will miss something. If you say to yourself that there is no such thing as energy, that there is no such thing as spirit, that there certainly could be no way for you as an individual to interact with energy and spirit, and that the world can only be mechanistic in nature, then you not only will be missing out on a massive opportunity for inspiration and renewal, but you would also be turning your back on your own spiritual self. You’d be deliberately choosing to block your own intuition and repress your own feelings. You’d be lying to yourself. For the sake of rationality? What’s rational about arguing that there is no such thing as energy? We know scientifically that there is. What’s rational about saying that there is no such thing as spirit? We know scientifically that the things that all the New Age “woo woo” people say will raise our vibrations and raise our spirits actually do improve our physical health in scientifically measurable, mathematically quantifiable ways. Meditation, prayer, music, chanting, nature, touch, colors, aromatherapy: all of these are things that rationally should not affect our supposedly nonexistent spirits but that nevertheless have been proven to help us. No, really, I found you because WP suggested this post is related to a post I will publishing later tonight…. and I’m so glad! Loved this post and the Spiritual Path post as well. You have clearly articulated so many of my own thoughts and beliefs. I thank you very much for sharing. I am probably slightly more skeptical/less “woo” than a lot of tarot readers, but that’s mostly because that’s my inborn temperament, not because I think I have some superior knowledge or approach that others should share. The only thing I know for sure is that tarot works, and for some reason I have a special skill with it. For which I am grateful! I’ve got a similar post in the works actually. Its theme is really that whether you believe in the “woo” or not, like you say, tarot *works*. I can’t see a reason to get worked up about *why* it works… that’s not my style. The mystery is cool with me. Thank you so much for following my blog – I’m so glad that we’ve connected! I often joke about the universe being on my side (or not) when I’ve had a good day (or not) but I truly do believe there’s energy around us, of which we tap into only a small portion. I’m looking forward to reading more of your posts! I agree, and thank you so much for the comment! I appreciate it. Thank you for this Bonnie! I’ve had tarot in my family for generations and some believe and some don’t. I am on the side that does and so much more! It is a great tool in our pocket as we journey through this life and it has enriched me so much more to believe than if I was to reject it (which would be refusing my inner voice anyway). You rock! Thank you for the reply and for your kind words, and you are quite welcome. I am so thrilled to see people reading this post still, even though I wrote it almost a year ago, I think. Yes, tarot is a great tool — and interestingly, sometimes the people who don’t believe in it are more willing to try it than the ones who do.